Each year over 14 million Americans are getting screened for colon cancer. Of these, according to the report “Complications of Colonoscopy in an Integrated Health Care Delivery System” by the Annals of Internal Medicine, an estimated 70,000 (0.5%) may be killed or injured by colonoscopy-related complications [link]. This figure is higher than the total number of annual deaths from colon cancer itself, 22% higher. Problems watching? View on YouTube. Read transcript. Dramatic increase in the incidence of colorectal cancer. Despite tens of millions of screening colonoscopies performed between the years 2000 and 2007, the annual incidence of colorectal cancer in the United States increased by about 30,000 more cases. More polyps are missed than found. Up to a third of all colonoscopies routinely miss polyps and cancerous tumors. According to the report I cited at the beginning of this page, practically 100% of all polyps are missed in the right (ascending) colon. Increased cancer risk from radiation. X-ray exposure from a single virtual colonoscopy increases one‘s lifetime risk of cancer by 20%. Virtual colonoscopies are now recommended every 5 years. By age 70 one‘s risk of developing any other form of cancer grows to 100%. Killing you with another form of cancer before the colon gets affected is one hell of the way to “prevent” colon cancer. Polypectomy doesn't prevent cancers. According to the research published back in 2006, the screened patients in all of the studies developed colorectal cancer “at the same rate as would be expected in the general population without screening” in the next few years, even though they have removed all found polyps. No clinical research to support the rationale of colonoscopy screening. According to the American Cancer Society, up untill now (that‘s in 2009) “…there are no prospective randomized controlled trials of screening colonoscopy for the reduction in incidence of or mortality from colorectal cancer.” In other words, the recommendation to undergo colonoscopy screening is based entirely on its income potential, not proven health benefits. View on YouTube. Read transcript. Overblown risk of colorectal cancer death. The risk of colorectal cancer is exaggerated for commercial purposes. Even a person in a high-risk group is 12 times as likely to die from heart disease; 10 times from any other cancer, 6 times from a medical error, 3 times from stroke, and twice as likely to die from an accident. A large-scale investigation of colonoscopy screening demonstrated its complete futility. The eighteen-years-long Minnesota Colon Cancer Control Study included 46,000+ patients between the ages of 50 and 80. It demonstrated only a 0.6% reduction in the incidence of colorectal cancer. Statistically speaking, this difference is even less than the chance outcome of one thousand coin flips. Colonoscopy screening increases mortality from all other causes, research shows. The Telemark Polyp Study I demonstrated a 157% increase in mortality among screened patients vis-à-vis unscreened controls. The decrease in the incidence of colorectal cancers was only… 2%, which, statistically speaking again, is essentially none at all. In the video I mistakenly indicate 57% increase in mortality instead of 157%. Colorectal cancer is a lifestyle disease. The majority of colorectal cancers aren't hereditary, and the majority of people in the high-risk group never develop one either. This means that colorectal cancer is connected to lifestyle factors, just like lung cancer is connected to one's smoking. Watch on YouTube. Read transcript. An estimated 95% of all polyps are benign. They will never become cancers, so removing them makes just as much sense as zapping the moles off your buttocks to prevent melanoma. Not all colorectal cancers are preceded by detectable polyps. It is believed an even larger share of colon cancers start from flat lesions that no one is suggesting to remove, even though they are considered five times as cancerous as large polyps. Increased cancer risk. Removing polyps or even doing biopsies releases cancer cells into the bloodstream and the colon's lumen. In turn, these cells may seed all other cancers throughout the body. Unreliable procedure. Even the most thorough endoscopists may miss up to 30% of detectable polyps. The less rigorous routinely miss up to 60%, including actual cancer tumors. All of them, regardless of skill or attention, miss 100% of polyps in the right colon. Unnecessary procedure. The average age for colorectal cancer diagnosis is 72. Commencing invasive screening and polypectomies in asymptomatic people at age 50 is just as absurd as taking contraceptives after menopause. High risk of internal bleeding. Polypectomy profoundly increases patients' risk of death from hard-to-detect internal bleeding, which may lead to ischemic stroke, myocardial ischemia, cardiac arrest, or sudden cardiac death. No demonstrable benefit. If polypectomies were, indeed, effective, with about half of Americans past age fifty getting screened, we should have enjoyed at least a 50% reduction in the incidence and mortality of colon cancer. Instead, we have a 22% increase in the incidence of colorectal cancer. Most likely, this increase is related to polypectomies. Part IV. Why Screening Colonoscopy Increases Mortality? Irreversible kidney damage. Over 85,000 people die annually from kidney failure — that is almost 50% more than from colorectal cancer. Many of these deaths have been precipitated by a careless and damaging colon prep. Severe dehydration. Colonoscopy prep causes severe dehydration. It may result in dizziness, syncope, ischemic stroke, blood clotting, sudden cardiac death, a fall or an accident, medication overdose, and other complications. The death rate related to these side effects is not known. Chronic bowel disorders. Bowel movement disruption following colonoscopy commonly leads to chronic constipation, severe diarrhea, diverticulitis, and bowel obstruction. All of these conditions constitute a primary cause of inflammatory bowel disease. That factor alone increases the risk of colon cancer by 32 times! Severe heart disease. The confirmed rate of severe cardiovascular risk from general anesthesia for low-risk surgical procedures, such as colonoscopy, ranges from 0.27% to 1.1% within the first six days after the surgery. Blood clotting and pulmonary embolism. Deep vein thrombosis and pulmonary embolism are a common side effect related to general anesthesia. Pulmonary embolism causes or contributes to up to 200,000 deaths annually in the United States. Chest infection and pneumonia. An estimated 25% of all people develop chest infections after general anesthesia, and many older people die weeks or months later from acute pneumonia. The mortality rate from pneumonia is 5%, and about 60,000 people die annually — more than from colorectal cancer. Complications and medical errors related to colonoscopy. At least 70,000 patients get injured by colonoscopy, according to actual reports. The unreported injury rate may be close to 280,000, or 2%. Increased risk of all other cancers. The potential long-term death toll from all other cancers caused by polypectomy-related contamination, and radiation exposure from virtual colonoscopies, is in the millions. No measurable impact relative to effort. Even according to Katie Couric, who has a penchant for exaggeration, colorectal cancer mortality is down just 2,500 cases a year, or under 2% of all deaths, a value too small to be considered a definite trendsetter. Q. Why is there such a large spread between colon cancer incidence and colon cancer death? Q. The trends show a small decrease in colon cancer incidence and death cited by Ms. Couric (5% for men and 4.5% for women). Do you think this decrease is related to screening colonoscopies? Q. Do you believe Ms. Couric knowingly “sold her soul” to the promoters of colorectal cancers? Q. Aren‘t you too harsh on this poor woman? Q. What about medical doctors, are they complicit in this scheme? Q. If virtual colonoscopies are so harmful, why are they permitted and encouraged? Q. What was Ms. Couric's financial gain in promoting colonoscopy screening? Q. Are you concerned with getting hit with a defamation lawsuit by Ms. Couric or her proxies? Q. How did you, and not the medical doctors, come up with this information? You can also access all these sections from selected sidebars. A wealthy acquaintance of mine died at the age of 56 from brain cancer. His brain tumor was probably contributed to by earlier treatment for colon cancer. In turn, his colon cancer was probably caused by frequent virtual colonoscopies and coronary angiograms — a preventative computer-assisted x-ray (CT scan) of, respectively, the colon and heart. 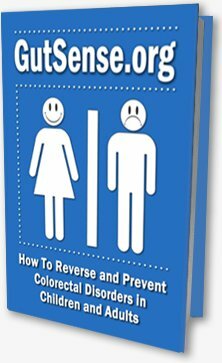 I wrote my books and developed this site for people who still value a buck and wish to prevent common gastrointestinal disorders and escape colorectal cancer without relying on cancer-causing screening colonoscopies, addictive laxatives, harmful fiber supplements, ineffective and deadly drugs, and irreversible, complication-prone surgeries. The information on this site complements and expands the content of Gut Sense and Fiber Menace. Both books evolved from my extensive research in the field of forensic nutrition. Unlike orthodox nutrition, which studies and promotes “health food, ” forensic nutrition studies why people get sick and die from a presumably “healthy ” diet.